There have been 1,000 deaths in police custody in the past 30 years - and not one officer has been convicted as a result. Simon Hatterstone reports on a film that exposes persistent racism at the heart of an institution. When Ken Fero turned his camera on the funeral of Shiji Lapite, he had no idea where it would lead him. Seven years, and hundreds of hours of footage later, he has ended up with one of the most powerful and despairing films ever to have made in this country. Injustice is the simple title and complex subject of the film that closes the Human Rights Film Festival. Fero and Tariq Mehmood's feature documents deaths in custody - mainly black deaths - over a six-year period. It is not just the stories of Shiji Lapite and Brian Douglas and Ibrahima Sey and Joy Gardner, four innocents who died at the hands of police brutality. It is about the lives of the families they have left behind, and their thwarted struggle for justice. It was December 16 1994 when Shiji Lapite was stopped by two police officers for "acting suspiciously". Half an hour later he was dead. We see Shiji's wife wailing: "They beat him to death. They killed him. Why should they kill him? Why? Why? Why?" Each "why" is more gut-wrenching. The question never gets answered. The cause of death was asphyxia from compression of the neck consistent with the application of a neckhold. Four months after Shiji Lapite's death, on May 3 1995, 33-year-old Brian Douglas was on his way home when he was stopped by two police officers, PC Tuffy and PC Harrison. Brian was a big, handsome, popular man. "It was hard not to like him," says his sister Brenda Weinberg. We see photos of him ironing his trousers and polishing his shoes, getting ready for a night out with his friends. Boy, he took such care of himself, says Brenda, he loved a good night out. Brian was with his friend Stafford when he was stopped. The officers ordered them out of the car and, apparently unprovoked, hit Brian on the head with a new US-style baton. The camera zooms in slowly on a terrible picture of Brian pierced by all kinds of tubes and instruments. After a few days, barely conscious, Brian asked his brother if he could come home. His brother held him down and hugged him. The humanity of Fero's film lies in the tiny details, the irrelevances. Brian's brother recalls how, even on his deathbed, Brian was allowed no peace: "There was too much activity in the room. That bugged me, all the activity." We see Brian's mother arrive in London from Jamaica. Her son has died a few minutes before she reaches the hospital, and she is barking, literally barking, with grief. When she collects herself, she tells a gathered crowd, "It's a very, very hard road to travel." 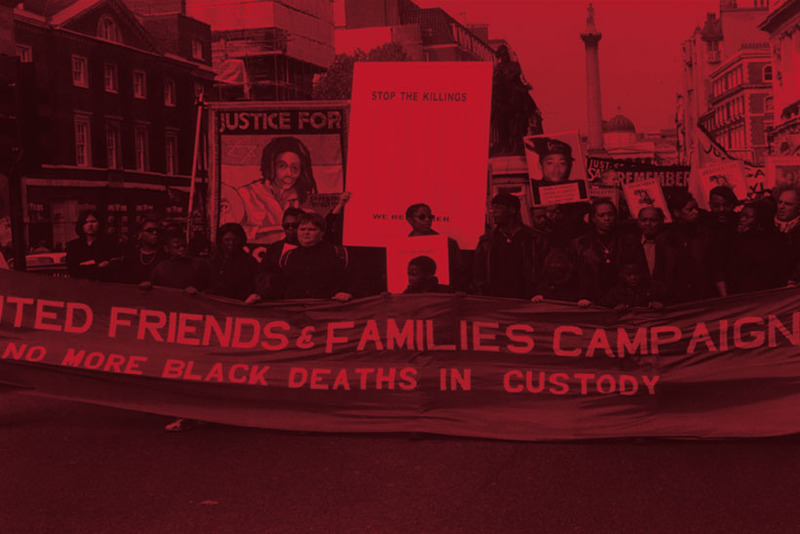 As the campaigns build around these two deaths, we discover more and more deaths in custody. In December 1995 Wayne Douglas was arrested for suspected burglary. He collapsed and died while detained at Brixton police station. In March 1996 Gambian asylum seeker Ibrahima Sey was forced to the ground, sprayed repeatedly with CS gas, and then held face down for 15 minutes. When he went totally limp and stopped breathing, an ambulance was called. He was dead by the time they reached the hospital. Ken Fero says he is not interested in making objective films. He knew whose side he was on from the start. "When we started investigating the cases, the facts were so clear that it was never a question of right and wrong, it was simply wrong, and a wrong that has been hidden." There are no interviews with police officers in the film. He says he would have happily interviewed the officers if he'd been allowed to. Fero, a former sculptor and painter, wears old-style pink Doc Martens and John Lennon glasses and a skinhead haircut. He began making films 15 years ago. He was frustrated by the people who came to see his art, felt they didn't bear much relation to the world he knew. He decided that film could be a more powerful and relevant medium - a political weapon. Fero was one of the founders of a collective called Migrant Media. He wanted his camera to document the everyday struggles of the communities he knew and lived with. If there was an angry exchange, a riot, a burnt car, a scrap on the streets, an unwelcome exchange of batons and bodies, his camera would be there to record it. Fero and his team of five have subsidised themselves over the seven years by making videos and doing odd jobs. He says that at the moment he can't see himself making another film because each one takes so much out of him. Not only has he been putting Injustice together, he has also been campaigning for the families involved. He says that is the only way he could have made the film - demonstrating to the families that first and foremost he was there as a friend and supporter, not just a reporter. Fero sees Injustice as a counter to the stories put out by the police about those who have died in custody. He talks about the common pattern he has observed with all the deaths in custody - never apologise, and blacken the victim's character. So Joy Gardner, who died after police stuck 13 feet of tape round her face while trying to restrain her, was always shown in a photograph as wild and uncontrollable. Fero shows pictures of her in her true light - a gorgeous, vibrant woman. In the film, even her irrepressible mother can't hold in her grief. She breaks down at a public meeting. "I didn't believe human beings could be so cruel to each other. You don't know how much I cry. My tears will catch them," she says, talking of the officers who killed her daughter. We see how the police profiles of the victims were taken up by the mainstream press and history was soon revised. So Shiji Lapite was no longer described as a father of two or an asylum seeker. In the public eye he became a drug dealer after an undercover officer claimed he found crack cocaine at the incident. One officer told the inquest that Shiji was "the biggest, strongest most violent black man" he'd ever seen. In fact, he was five foot 10. PC McCullum admitted kicking him twice in the head as hard as he could, and said he was using reasonable force to subdue a violent prisoner. The coroner told the jury they could only deliver a verdict of unlawful killing if they were satisfied that the criminal offence of manslaughter had been committed. The unanimous verdict was unlawful killing, which is rare in death-in-custody cases. Yet, astonish ingly, the Crown Prosecution Service (CPS) ruled that there was insufficent evidence to charge the officers with manslaughter. In August 1995, three months after the death of Brian Douglas, the family was finally allowed to bury him - without his brain. "As far as I'm concerned, we've buried him with the essential bit missing," Brenda says through her bitter tears. We have already heard at the inquest PC Tuffy claiming that he hit Brian on the shoulder and the baton slid up. Several witnesses claim they saw him raise his arm and bring the baton down on his head. Medical experts testify that the impact was the equivalent of him falling 11 times his own height on his head. The Douglas family hope for an unlawful killing verdict but the inquest jury deliver a verdict of death by misadventure. It's October 1997, and the film's one moment of triumph. Family and friends of Ibrahima Sey celebrate the verdict of unlawful killing. Ibrahima's cousin says "I stuck my fist in the air . . . he has gone, but not in vain." At last justice is within sight. But again the CPS ignored the inquest verdict and said there was insufficient evidence to prosecute. Since 1969, there have been 1,000 deaths in police custody in Britain. Only one of these deaths - David Oluywale, the first black man to die in custody - has resulted in an officer being convicted of a crime. Fero says there is still an establishment belief that the British police are the best in the world and that to acknowledge they are capable of, and sometimes guilty of, crimes would undermine the system. "In France and America, you have police officers charged and convicted of manslaughter and murder. Here it doesn't happen. No matter how many people die, it seems they are not going to admit there is a problem." Fero hopes Injustice will challenge the contemporary notion of what constitutes a British film. "People in America look at Britain and think of Four Weddings and a Funeral, with its funny, quirky characters. Well, our film is the other side of it. Our film is about four funerals." Now he faces his next battle; to get the film shown on television or in cinemas. Channel 4, which has backed previous Migrant Media films, has refused to have anything to do with the production of Injustice. The question now is whether they will show it. Meanwhile, he refuses to cut the film to appease the lawyers of mainstream distributors - that, according to Fero, would be a betrayal of the families. But, he insists, whatever it takes, the film will get shown. "We'll take it round the country ourselves if necessary and make sure it's seen by a millinon people." One of the most remarkable and moving aspects of Injustice is seeing how people change over time - physically, politically, spiritually. Every family starts out believing in the concept of justice, convinced that those responsible for the deaths of their loved ones will be punished. But as the years pass, they lose faith. Brenda Weinberg, Brian Douglas's sister, says: "Brian's last words were 'sort it'. And that's what we're trying to do. Sort it." Back in 1996, Brenda was urging the angry crowds to stay calm on a demonstration. Now she's not so sure if she was right to. "I can't grieve, I can't put Brian to rest ever if I know someone's walking around out there responsible for his death and they haven't been brought to justice. The only thing that does happen is that as the time gets longer it's any justice; it can be legal justice or street justice. I don't really care any more."